Like in previous years, the Union will make two trips to Florida this winter, with three games in the second leg. 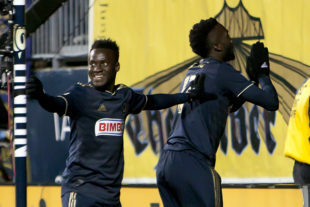 Philly.com has a piece on Mark McKenzie, who tied for second in U.S. Soccer’s Young Player of the Year voting. In U.S. Soccer Boys Development Academy East Conference news, the Union’s U-15 and U-16/U-17 are at the top of the division, and U-18/U-19s are doing well. Want Phang at your holiday party? $250 an hour. Kind of a steal compared to Gritty, who is $3,000 an hour. Assistant coach BJ Callaghan earned his U.S. Soccer Pro License. David Accam put together a football tournament for youngsters where he grew up in Accra, Ghana. The Union Soccer Podcast and It’s Always Soccer in Philadelphia are both recording new episodes today. Eastern Pennsylvania Youth Soccer revealed its 2018 Award Winners. The Galaxy welcome back Zlatan and Juninho. Kelyn Rowe escaped the Kraft organization and is off to Sporting KC. Matt Doyle is doing a season recap over three days this week. The union for MLS and NWSL referees took a strike authorization vote, and claims PRO is delaying CBA talks. Zack Steffen was named USMNT player of the year. He’s the fourth — and youngest — goalkeeper to win that award. Former USWNT star Cindy Parlow Cone is running for U.S. Soccer vice president. ICYMI, Dave Sarachan‘s next head coaching gig is at North Carolina FC. Manchester United finally sacked José Mourinho. As speculated, Ole Gunnar Solskjaer has been named the interim manager. Dortmund suffered their first Bundesliga loss of the season to promoted Fortuna Duesseldorf. Final score was 2-1. A derby in India that attracts 100,000 people. Three tips to help kids avoid youth soccer burnout. What a goal from that kid!. Amazing. All I gotta say to Soccer America is there’s a first time for everything (well, almost everything). I’m gonna miss Mourinho’s moaning. The slow-mo of the guy yelling in the video of that kids goal was WAY TOO funny to me… I don’t know, maybe I’m delirious from the holiday spirit… but I lost it! Two thumbs up for the podcast updates! Thanks John!! The Union have traded Rosenberry to Colorado for Garber Bucks.